Find a London Office - Who are we? Based in Blandford Street in London’s West End, Find a London Office are London’s leading Office Finders. We work with you to find the right london office – making a very complex and time consuming task incredibly easy for you. He has advised Central London office occupiers for over 20 years. He loves fighting their corner and making sure they get what they need - a great office on the best commercial terms available. Ian has a diverse client following and has always worked a lot with creative companies. When not finding office space for Central London tenants, Ian finds time to advise a private property company on finding new uses for obsolete office buildings in urban regeneration areas, in the UK and Northern Ireland. He lives in North London with his wife and three children. As the children get older his passion is going on ever more exciting holidays. Ben has been designing, building and promoting websites for 15 years. He is responsible for all of Find a London Office’s online activity, which broadly falls into 2 areas: gaining new clients and retaining existing ones. The former involves attracting visitors to the website - coordinating all online marketing campaigns - and then converting them into new clients. The latter centres on building and improving the custom built CRM (Client Relationship Management) system. Find a London Office is building a library of tools and resources for new and existing business tenants - anyone looking for office space in London. Ben is in overall charge of our content strategy. He is the editor for our blog - managing our various contributors and authors. He also designs and builds our tools and resources, such as the Office Space Calculator. Ben was born and brought up in London and is both a keen champion of the capital’s strengths as well as an observer of its many quirks, both very much in evidence in his blog posts! Ben is married with two daughters and lives in Surrey. He is keen runner and will be running the Surrey Half Marathon in March 2014 to raise money for Woking and Sam Beare Hospices. He is also a founding member of Pedal4Charity, who have been raising money for the Hospices for the past 6 years. His interests include politics and history, cricket, baking and photography and science fiction - in no particular order! Ben's Latest Post: Fantastic new feature: quickly and easily compare office types! Alice is responsible for our client relations. She is the first point of contact for all our new prospects. Alice is also in charge of all our social media communication. Alice trained at the KLC School of Interior Design in 2005 and Wimbledon Art School in 2007. She is also a director of Wick & Tallow, where she has developed an interest in the press and marketing. Alice loves London - anything cultural: the many design galleries and museums are particular favourites. Alice is also thrilled by the capital's burgeoning reputation for good food and the explosion of exciting, diverse, new restaurants throughout London. Jamie has over 9 years’ experience within the flexible workspace market and is a specialist in Serviced Offices, Managed Offices and Co-working Spaces. A Graduate of Leeds Metropolitan University and a qualified, non-practising Energy Surveyor, he entered the commercial property market working for a leading serviced office agency, followed by a serviced office provider. This invaluable experience of both sides of the market, together with his personable nature and wealth of knowledge, means Jamie is perfectly placed to understand, match and ultimately fulfil his brief of finding his clients their new flexible office space. Jamie has a real zest for life. He lives in North London with his wife and daughter, and aside from office space, his main passion is football, whether it be playing or supporting his beloved Arsenal. He also enjoys a spot of fine dining and going on holiday, but then again, who doesn’t! 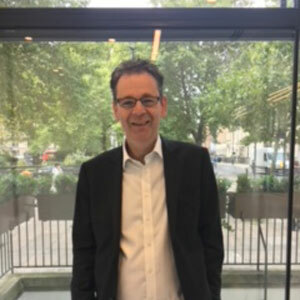 Stephen first entered the Commercial Property Market in June 1984 and with well over 30 years experience has built up an exhaustive client base and developed an extensive knowledge of the Central London Office Market. Stephen has a passion for acting for tenants in seeking and acquiring their new office premises on the best possible commercial terms. Over many years he has acted for a vast range of occupiers which typically include, fund managers, private banks, television and media companies, solicitors and accountants, and telecommunications, educational and Government related organisations. He lives in North West London with his wife and two children. Away from property you are very likely to find Stephen at The Emirates watching his beloved Arsenal (47 years and still going...!!) or in the summer at Lords, where he continues to dream of watching his 13 year old son play one day!